... and the new releases just keep on coming. 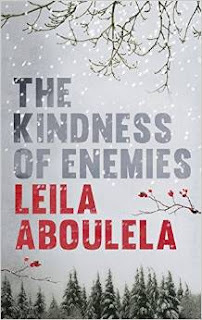 Here's another one from three times Orange Prize longlistee and winner of the Scottish Book Award and Caine Prize, Leila Aboulela. Aboulela's new novel, The Kindness of Enemies, is out August 2015. Moving from present-day Scotland to the court of the Tsar, The Kindness of Enemies is an epic of love and betrayal, reconciliation and war. Natasha is researching the life of Imam Shamil, a nineteenth-century warrior who battled to defend the Caucasus against Russian invasion. She uncovers a story of bravery and loss, and of captives traded between wild mountain hideouts and the refined court of the Tsar. The tale of Shamil and his lost son comes shockingly to life when Natasha realises that her star student, Oz, is descended from the warrior. Quickly, she becomes drawn to him, and to the alluring world of his family. But Natasha soon realises she is not the only one with an interest in Oz, and in what he might be hiding. As suspicion around him intensifies, Natasha realises everything she values stands in jeopardy.